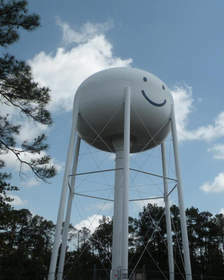 BASTROP, TX--(Marketwired - Mar 25, 2015) - Today Aqua Water Supply Corporation announced the recent completion of a $3 million capital improvement investment to upgrade a water treatment plant serving approximately 4,000 households in Bastrop County. The two-year infrastructure project is part of a larger long-range, strategic plan to ensure first-rate service for all of the cooperative utility's members across a 1,000-square mile service area. The capital improvement project involved a significant upgrade to the seven-million-gallon-per-day water treatment plant located at Camp Swift, which is the primary treatment facility serving Aqua Water Supply customers north of the Colorado River. Plant upgrades include an improved process for iron removal, increased pumping capacity, and overall enhancement of plant operations to better serve fast-growing population centers in the vicinities of Bastrop, Elgin, Manor and Pflugerville. "On behalf of our membership, Aqua Water Supply makes strategic capital investments to ensure that current and future water needs are met in a sensible and sustainable manner," said Dave McMurry, general manager, Aqua Water Supply. "March 22 was World Water Day 2015, reminding us all that access to a safe, reliable, sustainable source of water is vital not only to our lives, but to our livelihoods as well, particularly in a rural economy like Bastrop County." The upgrade project is the latest renovation of the Camp Swift water treatment plant, parts of which have been in service since World War II. Aqua Water Supply also is refurbishing the 70-year-old elevated storage tank at Camp Swift to extend its service life instead of replacing the tank. In addition to the water treatment plant improvement project, Aqua Water Supply is in the final phase of constructing a new 600,000-gallon elevated storage tank in the Circle "D" area northeast of Bastrop to improve service and provide better fire protection. This project is part of a program begun in 2011 that includes installation of up to 30 new fire hydrants each year. "When an emergency arises, Aqua Water Supply is prepared to support emergency management organizations operating within and beyond our service area," said McMurry. "During the 2011 Bastrop County Complex Fire, Aqua Water Supply was able to re-establish full water services to customers within five days, despite severe damage to our distribution system." Beyond planning for infrastructure improvements and fire protection, Aqua Water Supply implements a water conservation plan, which can be viewed on the organization's website. For more information, visit: www.aquawsc.com. Aqua Water Supply Corporation is a leading Texas water provider supplying water and wastewater services for homes, farms, businesses and ranches throughout East Central Texas. Aqua Water Supply is committed to industry-leading water management practices, sensible infrastructure improvements and accepted conservation methods to ensure a safe, reliable, sustainable water supply for generations to come. Since beginning operations in 1970, Aqua Water Supply has grown into a network of 1,800 miles of pipeline covering 1,000 square miles, currently serving more than 18,000 households. Its service area includes most of Bastrop County and portions of Lee, Caldwell, Fayette, Travis and Williamson counties. As a nonprofit cooperative, Aqua Water Supply is owned by its member customers and governed by a board of directors elected by the membership. Aqua Water Supply Corporation is a leading Texas water provider supplying water and wastewater services for homes, farms, businesses and ranches throughout East Central Texas.